I just got back from VidSummit 2018 with Derral Eves and Shonduras, and I have so many ACTIONABLE takeaways from this conference, I needed to share them with you! So, my VidSummit 2018 To-Do list has been turned into a podcast episode and blog post! Listen to more episodes of the Video Pursuit Podcast here or in Apple Podcasts or your favorite podcast player. Leave a review! It helps other people find my podcast as well. This episode is sponsored by my YouTube for Bloggers Challenge: 5 Days to a Polished & Profitable YouTube Presence is a free experience exclusively for bloggers who want to turn their mostly forgotten about YouTube channels into a polished and profitable YouTube presence. 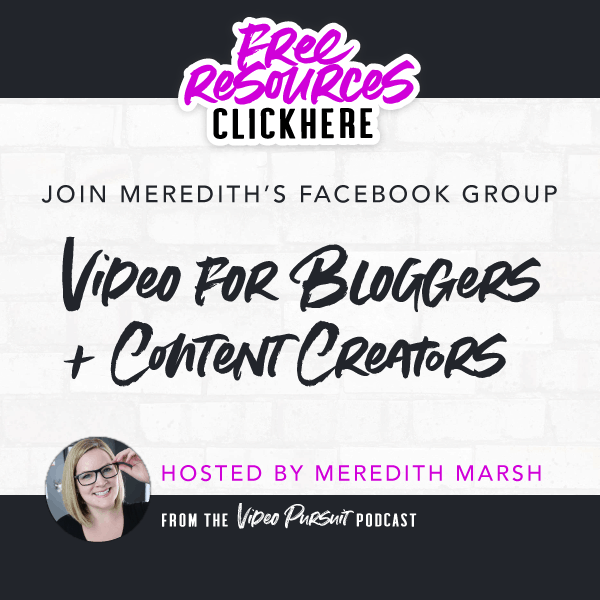 Join the conversation with fellow bloggers and content creators, hosted by Meredith. This is my challenge, so it’s hosted by yours truly, it’s totally free and it’s for bloggers at all stages of your video pursuit, even if you don’t have a youtube channel yet. Some product links in this post are affiliate links, and VidProMom will be compensated when you make a purchase by clicking our links. Read my disclosure policy here. A quick overview of VidSummit: It’s a YouTuber conference put on by Derral Eves and Shaun McBride (aka Shonduras). This post is not mean to be a review of VidSummit, but it truly was fantastic and well worth the price of admission. Two thumbs up! This was my first conference and I am so glad I had some online friends going that I hadn’t met in person. It is SO good to meet up in real life with people you are connected with online. I am an introvert, so walking up to strangers and making friends is not my forte. Sidenote: I actually met someone who walked up to me and asked if I was VidProMom. He said he had seen my 30 Days of GoPro series on YouTube, and because of that, he started thinking he could do video stuff. And now, he’s doing video stuff and YouTube and all that. OMG! How awesome is that!? I learned so much, and my brain was so full of to-do’s, that I tried to organize all my thoughts on my plane ride home from LA. As I did that, I thought it would be nice if I put all this in a podcast, so I can share these takeaways with you! Ok so let’s five in to my top actionable 5 takeaways from VidSummit2018. Other people’s stats really don’t matter, at all. What matters are your stats and improving your stats. 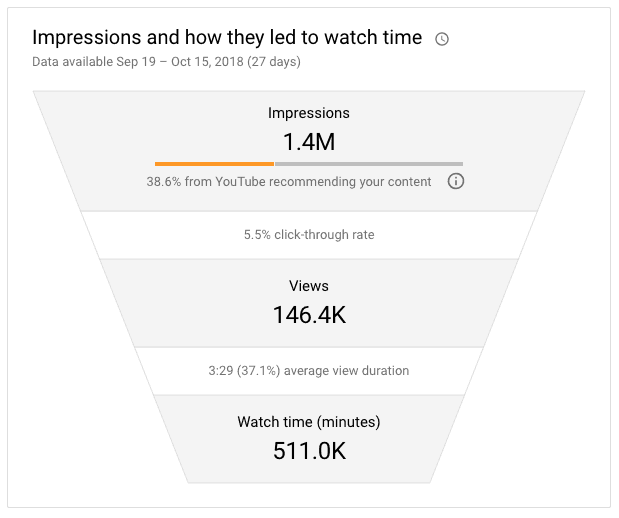 So the stats that we need to look at an improve are in the impressions funnel (inside the YouTube Creator Studio). You can find this metric inside of YouTube Creator Studio (the new version), under Analytics > Reach Viewers. Here’s mine for reference (but remember, my stats don’t matter. Only YOUR stats matter! Impressions funnel for VidProMom for the last 27 days. So near the top, where it says 38.5% from YouTube recommending your content – we want that to be as high as possible. It needs to bet like 80% or something!! So knowing that number, I can now work to improve it. Same thing with click-through rates. You can see I have 5.5% which, to be honest, is not horrible. But I can work to improve it. The point is, look at your own numbers, and try to make your numbers better. But HOW do you improve your YouTube stats? You might be wondering… BUT HOW? Right? One of my big brainteasers over the last couple of months is how can I increase my viewer retention. You don’t see this metric in the impressions funnel, but viewer retention is how long viewers are actually watching your video. Ideally, you want to shoot for more than 50% viewer retention. So that means 50% of the viewers that start watching your video, end up watching the whole video. This is something that I have known I needed to work on, but I have been really struggling with figuring out EXACT changes I should make in order to do so. But after listening to Tim Schmoyer and Evan Carmichael’s session at VidSummit 2018, I started to have some clarity around this. Some of the things I’m looking improving in my videos is the flow of my videos (you could call it a script but I don’t think about it as a script). I think I tend to drag on too much at the beginning of my videos. “Hey this is Meredith from vidpromom.com and in this video, I’m going to show you blah blah blah and here on the vidpromom channel, I help families create and capture reliable moments on video so if that sounds like your jam, hit subscribe and by the way I have a freebie you can download…” (for example). I don’t front load all that QUITE so bad lately but you get the idea. I need to work at getting right into the content and save CTA’s for the end. I don’t know why I have been doing it COMPLETELY BACKWARDS. But think about it… you want the retention, so it makes sense to get into the content as quick as possible. But not only that (and this is what really made my brain explode), the people who stay until the end–those are the people who will actually take action! Whether it’s to subscribe, or like, or download your freebie, or leave a comment, whatever. When you front-load your video with CTAs, you’re not only turning off viewers who are there for the content, but you’re also putting your CTAs in front of people who may or may not care to take any action at all. It’s the viewers at the END of your video who are likely care. So I will be scripting my videos a little bit different from now on, and I will definitely share the results here with you! Another crucial metric on YouTube is CTR (Click Through Rate). This is where titles and thumbnails come in. One of the things Derral Eves said in his keynote at VidSummit 2018 was that sometimes he’ll take a thumbnail and just flip the image… and the CTR will often improve! 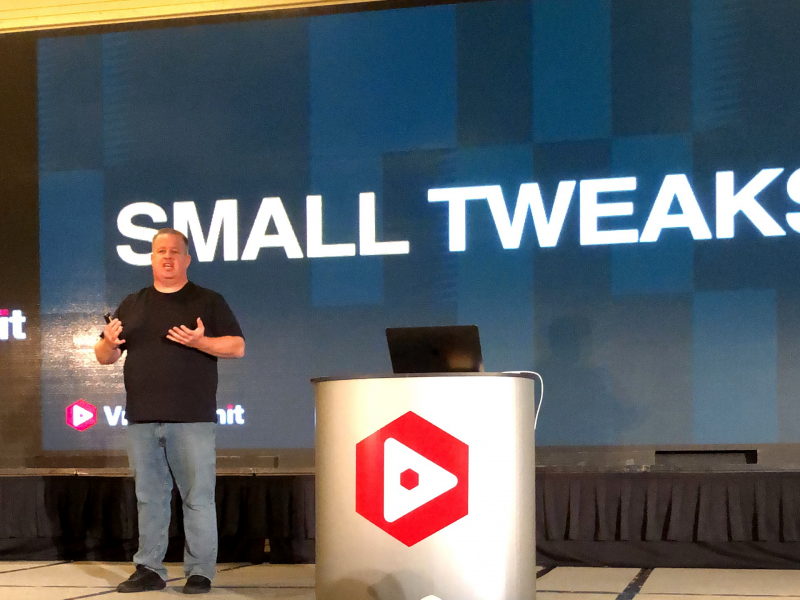 Derral’s big message in his keynote was to make small tweaks. The good news is, TubeBuddy now has the ability to split test your thumbnails at the Legend level. I am currently testing a handful of thumbnails (I will share the results when the test is done!). I believe you can get a 30-day free trial to try this out. So, go into your analytics and find your top 10 best videos based on average view duration and do an AB test on your thumbnails. 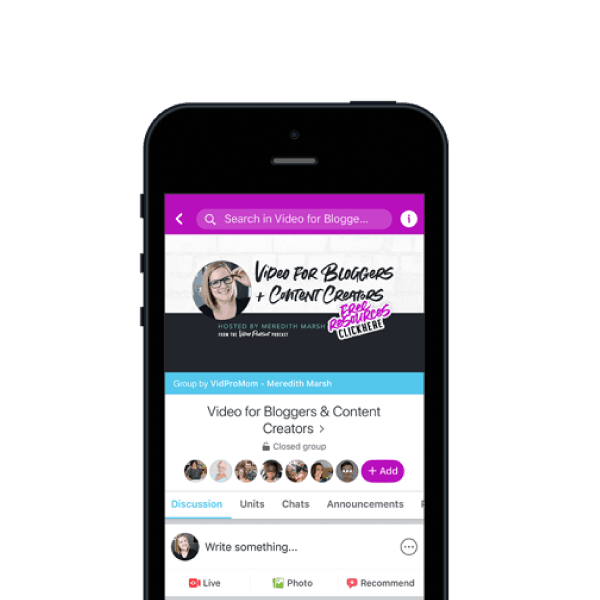 If you’re new to tube buddy you can use my referral code at vidpromom.com/tubebuddy and they’ll share some revenue with me. We can thank Tim Schmoyer and Evan Charmichal for this tip. Look in your analytics (you may need to use the Classic Creator Studio for this), find the Subscribers report, and then click on YouTube watch page. You will see how many subscribers your videos are bringing in during the time period you selected. The one that brings in the MOST subscribers should go in your “Channel Trailer” spot. WHAT? It’s so easy and simple, and makes SO much sense. In my case, I did not choose the video with the most subscribers because it wasn’t very representative of my channel. I chose the next one down. I explain more about this in the podcast episode at the top of this post. This is something that has been on my mind a lot lately, and seeing all these YouTubers in one place at the same time really brought this thought back into my mind. Something I notice is the length people are willing to go to achieve success (success being whatever it is they deem to be “success). The people who are on stage speaking are there (um, for the most part) because they’ve achieved a level of success in an area and IN THAT AREA they have out-worked others and even themselves to achieve that success. For example, Jack Conte from Patreon gave a keynote and he is an incredible storyteller. He had to have had 200-300 slides, because he had them going and going as he’s speaking, almost like B-roll. And his entire speech was a story (a very Jack Conte style story) and it was brilliant. I mean he must have had more slides in his keynote than every speaker at VidSummit combined. It kept the audience captivated but who is willing to put together THAT many slides?? Some of them were build-in after build-in and detailed, with charts and stuff and it had to have been a lot of work. But the result was an incredible keynote. It would have been incredible with no slides. In fact, Gary Vaynerchuk had zero slides, Peter McKinnon had zero slides, and these guys were awesome. Jack’s would have awesome been too but it was that last 1% of, that next level slide deck that just really blew me away. Jack Conte is just an example of out working yourself to be successful at a certain thing. NO! That is the WAY wrong attitude on YouTube! And I KNOW that. I KNOW THAT. But I need to push myself to be 1% better than who I was yesterday, 1% better than the people whose thumbnails show up next to mine on YouTube, 1% better than the video that YouTube’s AI is considering serving up next. I have so much more in my notes, and I can’t wait to dive in to implement what I’ve learned and share the results with you on the Video Pursuit Podcast. So stay tuned!! Don’t forget about my upcoming challenge – 5 Days to a Polished & Profitable YouTube Presence. It’s starting soon! Sign up here.